Oh, these muffins. 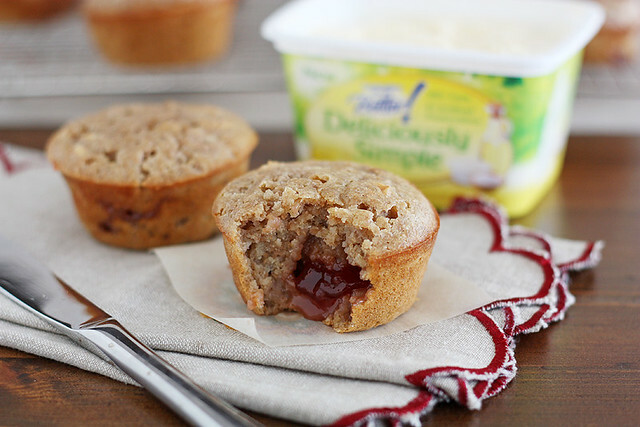 These jammy, crunchy, bran-y muffins. Just kidding. But basically, all you need to know is that these muffins? The ones I just mentioned that are filled with jam and toasted hazelnuts and wheat bran? They’re tasty and you should put them on your personal carb menu soonest (that’s totally a thing, by the way). Oh, and they’re also filled with I Can’t Believe It’s Not Butter!® Deliciously Simple™ spread. And that, my friends, is why in addition to the jammy, crunchy and bran-y nature of these muffins, they’re also the softest and melt-in-your-mouthiest muffins I’ve ever made. No lie. First, a little ditty about this special spread. Things it’s made with: Simple ingredients such as yogurt, canola oil and a pinch of salt. Things it’s not made with: Artificial preservatives. In other words, Deliciously Simple™ is made with ingredients that you recognize, and combined they turn into a creamy, buttery-tasting spread that works well not only in baked goods, but on them. I’ll be honest: We’re more of a butter family ’round here. But I can definitely see myself also using Deliciously Simple™ as an everyday spread on my toast and pancakes, or in my muffins and quick breads — especially if I want them to turn out super-soft, like these muffins did. Bonus: It comes out of the fridge smooth and spreadable, so you don’t need to wait for it to warm up to spread it on your favorite foods or whisk it into batters. That’s a win right there for me. But back to the muffins. Something magical happens when you fold strawberry jam and toasted chopped hazelnuts into a muffin batter, and that magic is precisely why I downed two of these before I even had a chance to put them away. I mean, do you see that oozy avalanche of warm strawberry jam coming out of the center of the muffin? I just could. Not. Stop. Myself. As a result, I immediately relegated them to the freezer to avoid eating any more. But I know they’re in there. And there is a slim chance that I can wait until tomorrow morning’s breakfast to eat another one. Or five. I’ll claim it as a survival tactic if I do, considering it’s been in the negative teens and twenties here lately. My personal carb menu = these muffins for the remainder of the week. My tummy is already happy about it. Heat oven to 350 degrees F. Place hazelnuts on a baking sheet. Toast 15 minutes, stirring occasionally, until golden brown and fragrant. Cool, then rub off the skins between two paper towels. Discard skins; roughly chop hazelnuts. If using a dark or nonstick muffin pan, reduce heat to 325 degrees F (if not, keep at 350 degrees F). Lightly grease muffin pan cups. In a large bowl, whisk together flours, wheat bran, sugar, baking powder and salt. 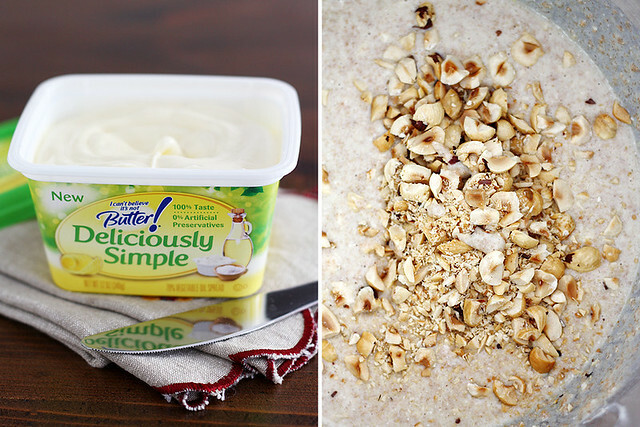 Add milk, Deliciously Simple™ spread and eggs; stir until just combined. Stir in chopped hazelnuts. Carefully fold in 1/2 cup strawberry jam. 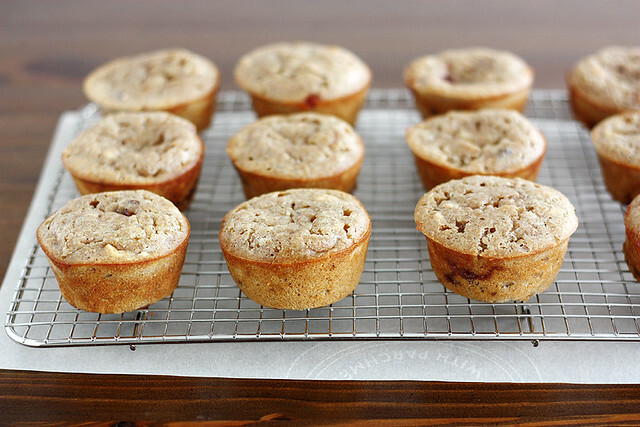 Divide batter evenly among muffin pan cups. Spoon a small dollop of remaining 1/4 cup jam on top of batter in each cup. Bake 20 to 25 minutes until a toothpick inserted in the center comes out clean. Cool 10 minutes in pan, then transfer muffins to a cooling rack to cool completely (you may need to run the back of a butter knife around the muffins to loosen them from the tin). Serve warm or room temperature with Deliciously Simple™ spread. Oh these muffins look delicious!!! The End. Oh boy!! That oozing jam looks perfect!! Oh my gosh! I love these! They’re like a little muffin surprise package. I need these muffins in my life. The jam filling is seriously genius!! Oh goooo! A jam-filled muffin?? The jam is already IN the muffin?! If that’s not convenience, I don’t know what is. Love them hazelnuts and everything about these addictive muffins! Mmmm the hazelnuts are such a great addition to these muffins. The jammy middle means no messy jam spreading either. Anyway to save on washing up. I can not believe how good they look while being made with spread! Yum! 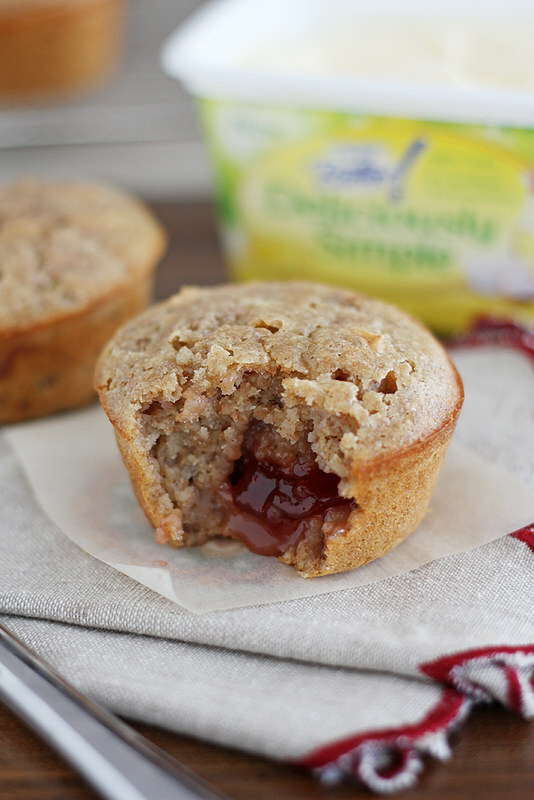 I love the idea of a jam filled muffin! Fo’ reals? Girl you slay me with your tasty muffin treats! Love that you filled them with jam! Zainab — Haha, thanks dear! Steph — Ha! I love that. Yes. These muffins look amazing! Oh man toasted hazelnuts and oozing jam filling? That is pure genius! That jam in the middle! Calling my name! Just give me all the muffins!!! These could not look any better. Love the jam! I’m swooning over that jam filling and the hazelnuts, of course! That pseudo butter is made out of yogurt! I’m definitely intrigued. And impressed because I typically think of ICBINB as being artificial ingredient overload. And the muffins are stunning. Because, obviously. Rachel — And it’s calling you back! 😉 Thanks! That jam filling is where it’s at.. Love these! Stephie — Dang. I wish I’d thought of naming these Surprise Muffins. That’s genius. Also my basement es su casa. Or something. Tieghan — Haha, I wish I could send you a whole case of ’em! Erin — Nothing worse than wanting a buttery, jammy muffin and having to wait for the dang butter to warm up, really. 🙂 Thanks, friend! 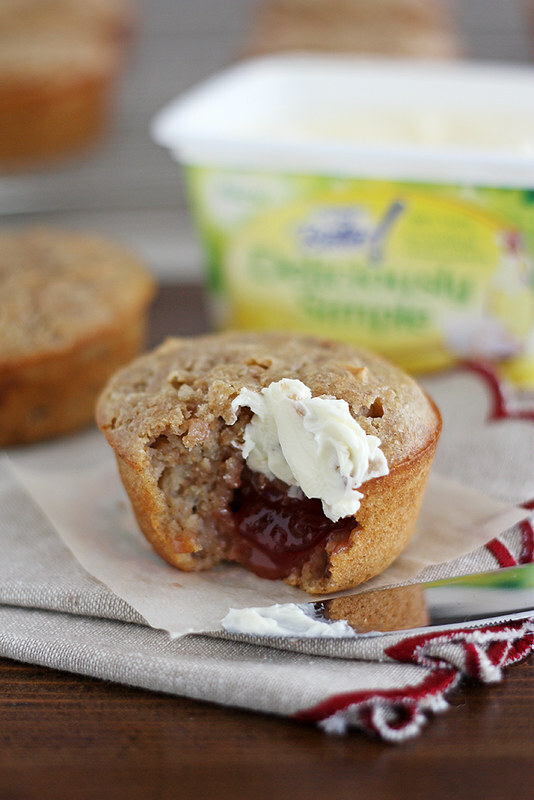 These look like muffin perfection! So good! I love the surprise jam filling! These look so hearty and perfect to take on the go for work!